We now live in a world that has more connections than ever before. We are texting, tweeting, facebooking, blogging and so on. Although these advancements make our lives better, they are also the crux of social distraction and sometimes we only need to tell someone hello or see how they are doing. These are the people we most care about, and we have begun to lose sight of connections between our closest friends and family. Ditto is a simple small device paired with your phone to keep your loved ones physically with you all the time. This creates distraction less and direct communication link to the people you care the most about. The Device comes in three pairing options. A coupling device called Uno, a three-person link called Tres and a four-way device called Cuatro. This device is especially important by creating priority between communication, where the cell phone lack the specific direct link. The project began by researching the role of long distance relationships with friends, family and significant others. By conducting user testing, the group found an insight, in many of the moments we wish to communicate to loved ones the most. We notice the need to tell someone hi, I love you or thinking of you while in meeting, at school or during events where a cell phone was inappropriate or unusable. This device aims to create a freedom to always stay un touch with the people who matter the most. 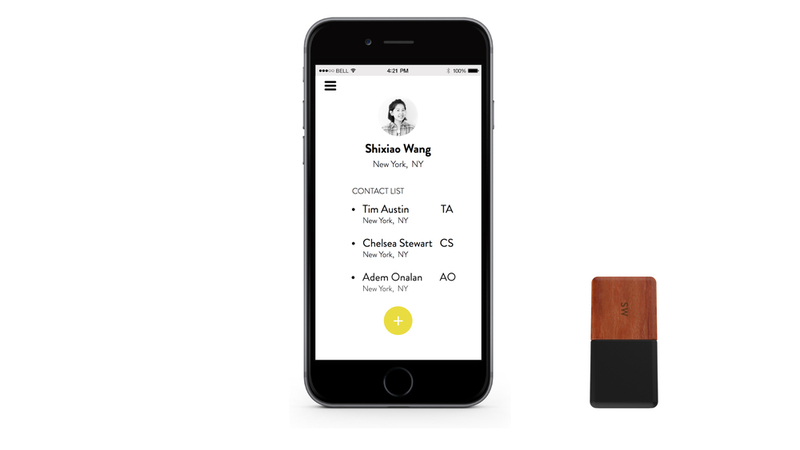 We wanted to design a totem-like small communication device which can be easily integrated into daily life. Ditto physically connects with the people you care the most about by enabling small messages we like to call "Pings". Ditto is small portable totem devices that can be synced with your phone and carried with you to freely ping your loved ones. Ditto comes in three different communication option, Uno, Tres and Cuatro. Ditto syncs with your phone to capitalize on moments the phone is unaccepted, unnecessary or unavailable. Each device pings to one or several specific users and they can ping back. Ditto Uno, a special device for couples, receive communications by rotating into a heart shape and blinking. Ditto Tres and Cuatro both blink and vibrate to indicate a message to the user. Each device is induction charged. Each device comes special ordered with engraved initials. Ditto Uno has engraved initials on both sides. Ditto Tres and Cuatro are engraved only on one side and digital on the other for a rearrangement of personal connections. Ditto comes in many different types of material finishings which can be customized and changed according to preference. This device makes our lives stronger by capitalizing on times or moments which you need to connect with loved ones, but do not have the time or need to carry a long conversation out. It's the perfect way to stay in touch and find time during the busy workday / school hours to simply tell the ones you love hi or I'm thinking of you.